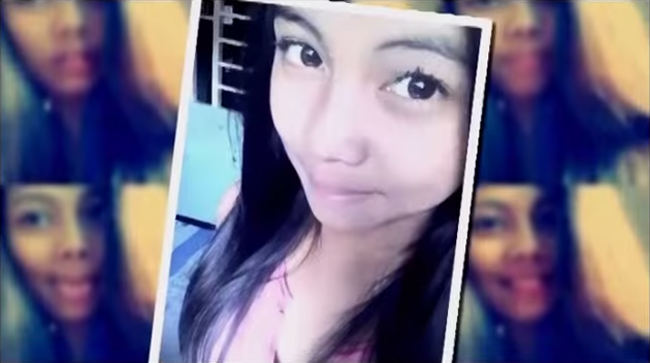 On November 8, 2014, Kapamilya’s weekend afternoon investigative show, SOCO featured a case of a teenager murdered by her boyfriend whom she had only met on Facebook. Erika Delos Santos is an 8th grader who studied in Pines National High School and like most teenagers, she was also addicted to Facebook. Her family knew that she was into the social media but they did not know that on February of 2014, she had already met a 23 year old man named Jay Odellubre. As seen in the teaser of SOCO, the girl seemed to fall in love with Odellubre every time she receives text and chat messages from him. She soon developed a relationship with him and was able to keep it in secret for a few months. According to her cousin, Erika really likes Facebook but they thought she will soon outgrow it. Little did they know that she had already put herself into trouble. They found out the Erika got pregnant and her parents decided to seek legal advice Women and Children Protection Desk of the Baguio City Police. P/Insp. Kate Awingan of Public Information Officer of the Baguio Ciy Police Office, advised the family to file a case of Seduction of Minor against Jay Odellubre. Thinking that everything will come to rest after the legal actions they had made, the family was greatly devastated when Erika went missing and was later on found dead in Sitio Amsing, Barangay Pacdal, Baguio City. She was reported to have had 21 stabbed wounds. Unknown to the family, Erika decided to meet her boyfriend when she told them that she will only go to an aunt’s house. Soon the suspect who turned out to be married and with two children, surfaced and surrendered to the police. His real name was Jayson Rebulledo. A case was filed against him and SOCO was able to feature what had transpired in the case.